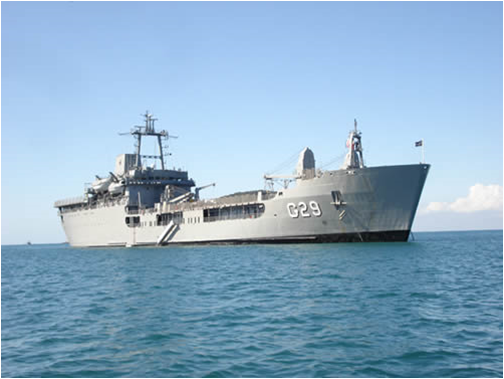 This vessel was originally RFA Sir Bedivere (L3004), a member of the British Round Table-class Landing Ships – Logistic (LSL). She was built between 1965 and 1967 by Hawthorn Leslie and updated between 1994 and 1998 at Rosyth. The refit included new engines. Sir Bedivere was due to decommission in 2011, but was sold three years early to the Brazilian Navy. Sir Bedivere was designed for logistical support of amphibious warfare missions, but not for amphibious assault. She has both bow and stern doors leading onto the main vehicle deck, making them roll-on/roll-off capable. There are two vehicle decks. In addition, the ship is able to beach herself to enable unloading in the absence of dock facilities. They also have a 20-tonne crane forward of the superstructure for lifting on and off equipment. There are two helicopter landing pads, one forward and one aft of the superstructure, permitting loading supplies for aerial delivery. Administrative transport of troops, vehicles and equipment. Transportation of other miscellaneous equipment. Landing of vehicles and supplies using two ‘Mexeflote’ self-propelled rafts. Whereas the warfighting capabilities of amphibious ships are most often emphasized, the diplomatic value of being able to dispatch rapid response marine units should not be underestimated. Whereas discussions about the development of a marine amphibious capability usually revolve around a combat unit for assault missions, a number of countries have chosen instead to develop administrative capabilities instead. In my paper, “Marines: Which Countries have them and Why,” of the 43 countries that possess either marines or naval infantry organizations, I identified eight with a marine ‘support’ organizations and four with marine engineering capabilities. Perhaps a rapid-response marine engineering unit is better suited as a first step into developing a marine organization in this new security environment. It would be flexible enough for useful employment in all three naval roles (military, constabulary and diplomatic).